You can't write this… Seriously!! Bikini Season, Macy’s and US. Once you pass the age where you pick out the cutest, brightest, rainbow unicorniest swimsuit you can find, no one I have ever known actually enjoys swimsuit shopping. As tweens and teens and even grown women, this is a dreaded task that many of us put off, for years at a time. It is the one plight as women we do not go alone. It does not matter if you are tall or short, fat or skinny, flat or curvy, black or white, or any where in between, shopping for bathing suits just plain stinks. Study: Trying on swimsuits makes women feel anxious, depressed. The stress starts long before the fitting room. It’s unavoidable, especially in my little slice of paradise where the weather seldom dips below 70. “Get into shape for bikini season” The articles in women’s magazines and endless advertisements cry-out. 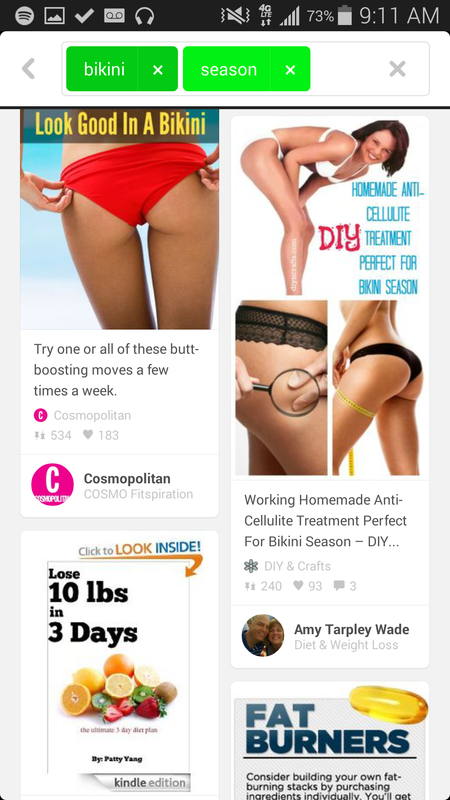 Just head on over to Pinterest for some “Fitspiration” so you can shame yourself into fitting into the bikini you feel miserable in. Women’s bodies are constantly in a state of flux. Like most women, I am somewhere between fat and skinny. I am no longer “Plus Sized” but do not have a “hot Bikini Bod”. My breasts that barely fill a B-cup are smaller than average, as is my waist. My hips and thighs and backside, however, more than make up for any “lack” elsewhere. And that is ok. I am ok. So for the first time. I accepted a new label with pride: Curvy. It’s that time. Join me on my journey to find my swimsuit. Here we are. Together. Women (and the men who are still reading this), united as one. Congratulations, we have demonstrated a level of acceptance of where our bodies are this bikini fun in the sun season and we avoided the minefield in our minds and mustered up enough gumption to shop for our swimsuits. It’s 2015 friends. Thankfully this search starts not with piles of awkwardly cut Lycra and fitting rooms, it starts in the comfort of our own homes… with a Google search. 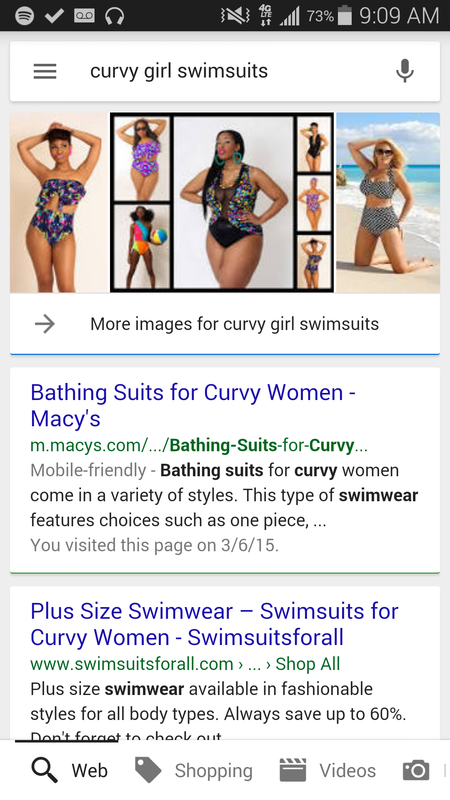 With confidence I type “Curvy Girl Swimsuits” into Google. Oh those pictures are cute! I can find something here, maybe they will have it in the store. I am saving time. Maybe I can find a coupon…..
Now I don’t like shaming any woman. I don’t like fat shaming, I don’t like skinny shaming…. Those women are beautiful, albeit photoshopped, and I am sure they have some issues. Just. Like. Me. Being the first one down after the ads – I can only assume that Macy’s has spent some time and money on search engine optimization. Bathing Suits for Curvy Women – Macy’s I happily clicked. I don’t know how to make Macy’s listen. But I want it fixed. This confident curvy girl demands proper representation of my label. Please? Ladies, clearly the “attack” on our bodies, self-esteem, confidence, is endless. But it is avoidable. Confidence starts in the mind and can stay strong through any “attack”, perceived or premeditated. I am still confident that I will find my curvy girl swimsuit for this fun in the sun season. I will be frolicking without thoughts of thigh gap. Chafing from chub rub? Maybe, but not thigh gap. I will play without thinking about my collarbones. My cellulite already has its first sunburn. Happy Fun In The Sun Season Ladies. You are loved and not alone. Regardless of your label, or lack of representation.